You draw upon your life, other people's experiences – then you write about it." Robert Cray turns in an assured, highly emotive set with Nothin But Love. 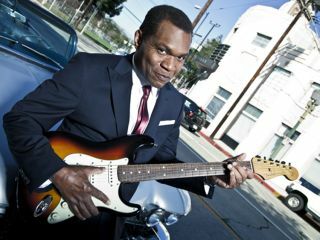 On his 16th studio album, Nothin But Love, five-time Grammy winner Robert Cray turns in some of the most incredibly vivid and least self-conscious performances of his storied career. The songs' lyrics offer powerful perceptions and insights, and their meanings are deepened by a deceptively simple, no-strings-attached delivery from his ace band (which includes keyboardist Jim Pugh, bassist Richard Cousins and drummer Tony Braunagel). Time and experience has turned Cray into something of a world-wise, elder statesman in-waiting of the blues. Age has mellowed his already silky-smooth voice, and the effect is remarkable - even when he's dishing out some of life's hard truths, there's a reassuring quality that seems to say, "Yeah, it's tough, but it's going to be OK. All you have to do is persevere." And his guitar playing, a curious mix of the stinging and sweet, has never been more exciting and steeped in passion. Cray checked in with MusicRadar from a tour stop in Lincoln, Nebraska, to talk about the new album, working with producer Kevin Shirley (Joe Bonamassa, Iron Maiden, Aerosmith), his guitars and gear, and whether he's hearing any hot new blues players who might grab the baton from him one day. You've made your fair share of albums - some you probably like better than others. Did you have any kind of different agenda going into Nothin But Love? "Well, with all the records we've done, we've never had any kind of concept, idea or anything like that, other than coming out of the studio with a good record. That sounds simple, but it can be a hard goal sometimes, especially in this band where we have everybody contributing to the writing. There's a lot of different voices going on, so you have to pull it together and make sure everything works. "A week before we went into the studio, we rehearsed these songs and kind of introduced them to one another. The week before that, we'd just finished doing 12 days on the road. That was important, really, because we went straight into rehearsals with that live energy, and we were able keep that steam going as we went into the studio. "It was a lot better than our approach on previous album sessions. Whereas before, even though we had written the songs and rehearsed them, we hadn't played together, really, for months - and then we'd go in to record. This time, we were in good shape." How did you choose Kevin Shirley to produce? Had you guys talked about doing something in the past? "Well, Kevin's done a lot of work with Provogue, which is the record label that I'm with now. I was talking with Ed van Zijl from the label, and he's really enjoyed working with Kevin - had a lot of great things to say about him. He told be about all the rock bands and artists Kevin's worked with, and he suggested that I take a meeting with him. So I did, and we got along really well. After that, we met again, and this time we discussed how we would go about making a record. Kevin's idea was very much in line with what I'm used to, which is cutting it live, basically." Even so, did he throw any kind of curve balls or different approaches at you? "I don't think there was any different approach. The only thing that was different was the fact that we'd never worked with Kevin before. And in this band, I'd done some production for some recordings that we've made, and we also have Jim Pugh and Tony Braunagel, and they've done production work for us. So the biggest deal was to get out of the producer's chair and let somebody else take control. You have to know when to get out of the way." And how is that for you - a little scary, or is it a delightful relief, like, "OK, I don't have to worry about this part, because he's got it"? How do you and Kevin go about choosing material? Did you make demos of everything? Were songs ever born out of jams? "No. For us, we didn't have any of those issues at all. We came into the studio with 10 songs. That's all we had. No, wait… we had 12 songs. We had about 12 songs and we pretty much weeded them out before we even got into the studio. We'd made a couple of passes at ones that we knew weren't going to be included, so you know, they were half-assed attempts that we basically just let them go, and everybody knew it. And then Kevin came in with the idea of doing the cover of Blues Get Off My Shoulder, and we added that to the mix." Were there any covers that the band particularly wanted to record? "I don't think so. Kevin's idea was fine by us. Actually, we didn't know that he was aware of that song. He was, but he wasn't aware of the original and who'd done it - Bobby Parker. Or maybe he was aware, but he hadn't heard it. When he brought up the song, he'd mentioned someone else who had recorded it. But we all knew the Bobby Parker original - we were hip to it from listening to it years and years ago. It was a great suggestion, but we wanted to do our version of it." Did Kevin do anything different as far as how you're used to recording your guitar? "No, it wasn't changed in any way. We did the same miking techniques - close and distant - and I used my same gear. I had my choice of several amps. I was running a Matchless Clubman 35 on some songs, and then I had a Fender Vibro-King. Let's see, there was a Magnatone 260 - I used that for a lot of rhythm tracks, actually. I also had a Fender Twin Reverb Reissue and a Super Reverb. "I mentioned the Magnatone, but that was mainly for the vibrato on a lot of the tracks. Kevin added some kind of phase on the rhythm tracks. He got a really good sound." Kevin commented on the live aspect of the record, that it had the sound of "dirt under the fingernails." Were all the songs tracked from off-the-floor performances? "Yeah. We'd track everything live, and I'd go back and run the tape and just play on top of that. That's how the whole thing went." Your guitar tone is unmistakable. On the song Won't Be Coming Home, right away, within the first 15 seconds, there's that tangly, chimey sound that says "Robert Cray." You're probably going to say it all comes from the fingers, right? "Yeah, I would say that! [laughs] I mean, you know, I play through 10-inch speakers, and my sound is ripe, obviously. The speakers add to that, that quick response, that high, tinny sound. And the rest, like you said, it's the fingers. It's how you touch the guitar." It's funny you say "tinny." Some guitar players have that, a tinny sound, and it's annoying as hell. Yet you're about to make it sound incredibly sweet and soulful. "It's because of the vibrato. It's the way you touch the guitar. It would sound tinny and really bad if you hit it straight with no movement. To make notes sound pleasing and alive, you have to move them around." Your voice is pushed way up in the mix. A lot of great guitar players seem to downplay their singing. They have the attitude of "the guitar's the star." "I know what you mean. I do enjoy singing, I really do. I always have. And I like the challenge of trying to do both. That's just how it's been for me. I'm just as equal a singing fan as I am a guitar fan." The song Side Dish has a real raucous 1950's rock 'n' roll vibe. How did that one come about? "Well, it's a song that I put together, obviously - it's a guitar-driven song. It was just something that came into my head. It's happy and silly, something we'd never done, as this band anyway. The way I first heard it was just as an instrumental, something that if you took away the lyrics it would be a play off of a Freddie King-type thing or Albert Collins or something like that." On the flip side, you tackle loneliness and heartache on some of the other songs with striking poignancy. You seem to be a pretty happy guy, though. Where do you go in your head to get those moments? They certainly ring true. "You have to go back. I have to go back and think about where I've been, certain situations and times in my life. There's also those situations where you watch other people around you, so a lot of those ideas are observational. Still, when you take those ideas, and if you can relate to any of it, you can put more of yourself into it, even if it's observational. The song Fix This - I wrote that about someone who I know really well, and I watched him go through this happy relationship, but everyone around him knew it wasn't going to work. You draw upon your life, other people's experiences - then you write about it." Let's talk about your guitars. What was your go-to arsenal for this record? Most of the time, it was a Fender Stratocaster, my Robert Cray model. But I also used a Gibson Le Grand on a lot of the rhythm tracks. On something like Side Dish, I went back and doubled the basslines with Fender VI. I think that was basically it." Effects-wise, what were you using? "No effects. I just plugged straight into the amp. On the song Worry, in the bridge, there's a bit of phase that Kevin added, and there's something on another track that he put on. But as for myself, it's just straight into the amplifiers." Any new blues players who have impressed you? Have you heard Gary Clark Jr.?